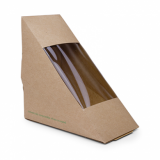 A selection of Vegware large-sized sandwich wedge boxes with green leaf band; a collection of quality eco packaging to bring street food style into your bar. 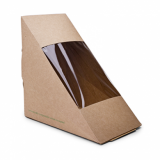 The sandwich wedge with an eco edge! Completely compostable - even the clear window is made of plants, not plastic. Supplied flat, simple assembly.